→ Article: Monitoring Plans - What is the goal of your compressed air testing? Monitoring Plans - What is the goal of your compressed air testing? To follow the necessary regulations and ensure the safety of an end product, companies should always employ a compressed air monitoring plan. Though the goal of any monitoring plan is ultimately safety, there are varying ways to ensure product safety and each manufacturer must set their goals according to their specific circumstances and needs. To determine the appropriate goal of an individual’s monitoring plan, companies should assess their risks and understand the regulations in place. Manufacturers may have varying compressed air testing goals that are quite unique to their industry, end product, or even, location. This article will help to determine those goals by outlining the risks that compressed air systems face, the options that users have when it comes to monitoring, and the best ways to ensure the quality of the compressed air system. WHAT HAZARDS AFFECT COMPRESSED AIR SYSTEMS? Compressed air systems are often complicated and can be affected by a variety of risks. Contaminated intake air, inappropriate pipes or filters, leaks, or systemic age can all lead to contamination of the compressed air. Aside from these hazards, companies must also consider the seasonal & environmental changes affecting the quality of their compressed air. Manufacturers need to be aware of the risks associated with particle, water vapor, oil vapor, oil mist, gas, and microbial contamination. Any of these contaminants could lead to an unsafe product which puts end-users at risk. Intake systems can bring problematic gases and oil into the compressor system. Faulty or inappropriate filters and piping can create particle contamination. Leaks can cause water vapor to accumulate. Even something as simple as a cleaning solution can contaminate your system with oil. Part of each manufacturers’ monitoring plan should include the understanding of hazards that could impact the safety of their end product. A risk assessment can help users understand the unique hazards and risks that their company faces. Assess the operations that could harm a product, the extent to which it could be harmed, and how likely that harm is to occur (Smith, 2016). Organizations such as ISO, SQF, CAGI, BRC and FDA have varying recommendations and guidelines when it comes to compressed air testing and system monitoring. 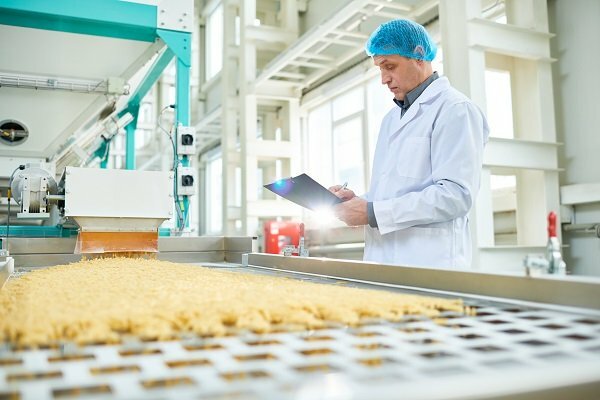 Because there is no universally accepted regulating body for food manufacturing, it is important for each manufacturer to understand which body it must adhere to. The FDA implemented FSMA to clarify the actions that need to be taken to protect consumers from foodborne illnesses. SQF code Edition 8 states that a compressed air monitoring plan must be in place to ensure the purity of the air. BRC uses HACCP to ensure and control the biological, chemical and physical hazards that can be associated with a food manufacturing system. 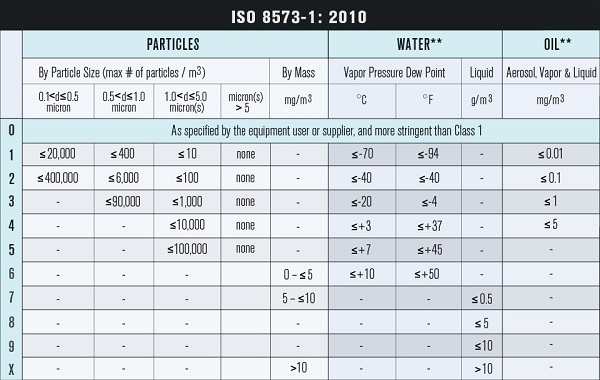 ISO 8573 is one of the most clear and specific standards for compressed air and is therefore used by many manufacturers. These standards should be considered in the creation of a compressed air testing goal and used to analyze the results. WHAT ARE THE CONSEQUENCES OF AN UNHEALTHY COMPRESSED AIR SYSTEM? Contamination in a compressed air system can be costly, immensely time-consuming, and dangerous to consumers. Without regular testing, the date, location, and extent of contamination can be very difficult, or even impossible, to determine. A lack of information prevents manufacturers from making educated decisions regarding the safety of their product. Users should rely on their recorded data to determine when and how any contamination occurs. In 2001, a Fortune 500 company initiated a Class II recall due to product contamination from their compressed air system. Over 142 thousand contaminated cases were recalled and the company experienced a $2 million potential profit loss (Sterling, 2011). Compressed air systems that are unmonitored often result in ineffective filters, leaks, or system failures which can all be extremely costly. Leaks alone can cost companies anywhere between $25-$30,0000 (Kaeser Compressors, 2007). For example, if a company has not tested for three years, and then discovers contamination, they will not be able to pinpoint whether the contamination occurred 2 and a half years ago or yesterday. Consideration should be given to the consequences of contamination when deciding upon a compressed air testing goal. Different usages and potential hazards can lead a company to a different strategy. Consequences and the risk of harm can vary due to the type of contact (direct or indirect) and the extent of compressed air usage. Though no compressed air system is perfect, care must be taken to set acceptable goals (Marshall, 2013). Many companies want to create a baseline, which allows them to understand where their quality levels have been in the past. This type of testing is a starting point which can be used to analyze future test results. Creating a monitoring plan requires recorded data which then allows users to troubleshoot and improve the systems based on third-party analysis (Marshall, 2015). Quarterly testing provides sufficient data to understand seasonal trends and to ensure the quality of the compressed air year-round. Some companies choose to test only once per year to satisfy SQF monitoring requirements. This one-time test is merely a snapshot of your system at that particular time, but will suffice for GFSI certification audits at least at this time. An annual test is not a comprehensive view of your compressor system and can put manufacturers at risk. If a company wants to know whether there is a degradation of compressed air quality from the first sampling point to the last, then their monitoring plan should reflect this goal. This is a valuable way to determine whether the piping or filters are adding to contamination. Degradation becomes apparent when the quality of the compressed air is lower at the end of the line. Testing various points from the beginning of the line to the end helps manufacturers understand how their systems affect the quality of their air. If the company’s goal is to understand the rate at which filter changes are needed, then they, too, can create a monitoring plan and use compressed air testing to accomplish this. Compressed air systems usually have scheduled filter changes based on the manufacturer’s recommendations. Because each company faces unique challenges and different hazards, some companies may want to ensure that the recommended filter changes occur often enough for their particular system. Testing after any maintenance provides reassurance that no contamination has been introduced and that all control measures are working effectively. To create a compressed air monitoring plan, a user or company must document the current system. This means taking stock of all the pieces, parts, and structures that make up the system. A risk assessment is particularly useful in the creation of your monitoring plan. Though this can be a tedious task, it is exceedingly useful should the company need to troubleshoot a particular section or point of use. Creating a diagram of the compressor system, piping and outlets will help to ensure that no points of use are missed. It is critical to provide a map to track airflow and potential contamination sources. Ensure that all maintenance is accurately documented. Everything from filter changes, to equipment alterations, to routine maintenance should be logged. Any of these activities could introduce contamination and it is critical to understand when and where these occurred. Keep detailed and quality controlled records to provide at your audit. Perform regular compressed air testing according to your company’s regulations and goals. Testing for particles, water, oil, pure gas, and microorganisms will help establish data points to later be used in analysis. A 3rd party, accredited laboratory is the best resource to ensure that your compressed air meets the appropriate purity classes and that your system is performing at the necessary quality standards. The final step of your monitoring plan is to analyze the data points. Reviewing the trends can help to understand seasonal changes, filter efficacy, and systemic hazards. Regardless of whether your company tests once, annually, around maintenance periods or every month, a laboratory that specializes in compressed air testing will analyze your samples and help to ensure the health of your compressed air system. “Designing Your Compressed Air System .” Http://Us.kaeser.com/, Kaeser Compressors, 2007, us.kaeser.com/m/Images/USGUIDE3_DesigningYourCompAirSys-tcm266-12601.pdf. Labs, Wayne. “Exclusive: Compressed Air or Environmental Problems? Here Are Solutions.” Food Engineering RSS, Food Engineering, 14 Aug. 2013, www.foodengineeringmag.com/articles/91109-exclusive-compressed-air-or-environmental-problems-here-are-soluontis. Marler, Bill. “Kraft Recalls Velveeta Shells & Cheese Cups.” Food Safety News, 11 Sept. 2012, www.foodsafetynews.com/2011/10/kraft-recalls-velveeta-shell-cheese-cups. Marshall, Ron. “13 Ways to Optimize Your Compressed Air System.” Plant Services, Putman Media, 2015, www.plantservices.com/articles/2015/13-ways-to-optimize-your-compressed-air-system. Marshall, Ron. “Is Compressed Air Perfection an Attainable Goal or a Myth?” Plant Services, Manitoba Hydro, 2013, www.plantservices.com/articles/2013/04-perfect-compressed-air-system. Rabin, Roni Caryn. “The Chemicals in Your Mac and Cheese.” The New York Times, The New York Times, 13 July 2017, www.nytimes.com/2017/07/12/well/eat/the-chemicals-in-your-mac-and-cheese.html. 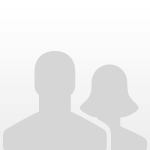 Smith, Richard A. “Assessing the Impact of Compressed Air Quality on Food Products.” Compressed Air Best Practices, Air Best Practices, 2016, www.airchecklab.com/resources/CABP-Compressed-Air-Testing-Risk-Assessment-Trace-Analytics.pdf. Sterling, Justine. “Recall: 137,000 Cases of Kraft Velveeta Shells & Cheese.” Consumer Reports, 3 Oct. 2011, www.consumerreports.org/cro/news/2011/10/recall-137-000-cases-of-kraft-velveeta-shells-cheese/index.htm. The AirCheck team of experts is HACCP certified and committed to providing top-of-the-line customer service and support. They have the most knowledgable and dedicated team in the field of compressed air and gas testing. Trace Analytics is an A2LA accredited laboratory specializing in compressed air and gas testing for food and beverage manufacturing facilities. Using ISO 8573 sampling and analytical methods, their laboratory tests for particles (0.5-5 microns), water, oil aerosol, oil vapor, and microbial contaminants found in compressed air. For over 29 years, they’ve upheld the highest industry standards of health and safety, delivering uncompromising quality worldwide in accordance with ISO, SQF, BRC, and FDA requirements.